How to edit an ongoing Marketing Plan? Steps to make changes to a current Marketing Plan. 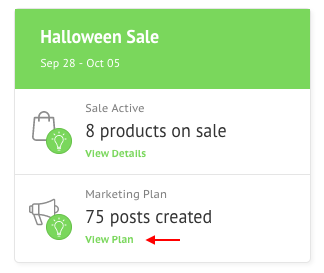 1.Go to the Marketing tab in your Socioh dashboard. 3. If the channel for which you want to make edits is already a part of the ongoing marketing plan, you'll need to first Stop its Marketing Plan. 4. Select the channel by checking the box and clicking on Settings. 5. 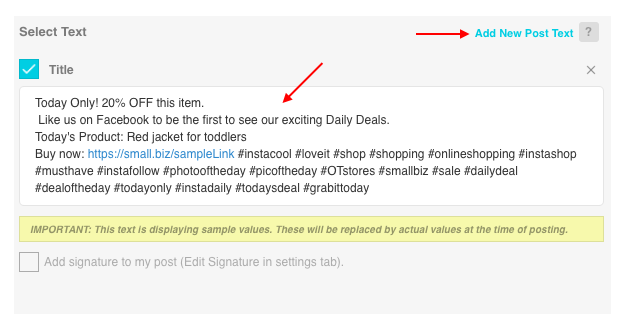 You can edit the time and frequency of your posts, post text and the layout selection. Here are the steps for each of these edits. 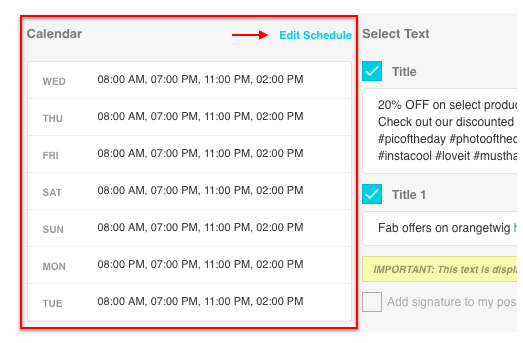 Click on Edit Schedule in the left section and make the necessary changes. To edit an existing text, click in the text box and make your changes. And if you'd like to add new text, click on Add New Post Text. Scroll down to Layout Selection and click on Select Specific Layouts. Click on Manage to select specific layouts. Re-Create your Marketing Plan and don't forget to Save it.